What do you get when you put together pasta, roasted cherry tomatoes, ricotta and (if you’re a meat eater) Italian sausage? The best weeknight dinner ever! A delicious, hearty meal that feeds 4-6 for barely $15. This go-to pasta takes barely any effort. The secret is the roasted tomatoes—their juices mingled with olive oil make an instant pasta sauce that, when combined with ricotta, turns irresistibly creamy. Yes, irresistibly. Let’s just say that sweet and tart roasted tomatoes, herbaceous olive oil and creamy ricotta make one crazy good sauce, no simmering required. Roasting tomatoes takes zero effort, but does require 30-45 minutes (unattended) cooking time. To keep this dish super quick during the week, I store roasted tomatoes cooked during naptime over the weekend in the fridge, along with the oil in which they were roasted. 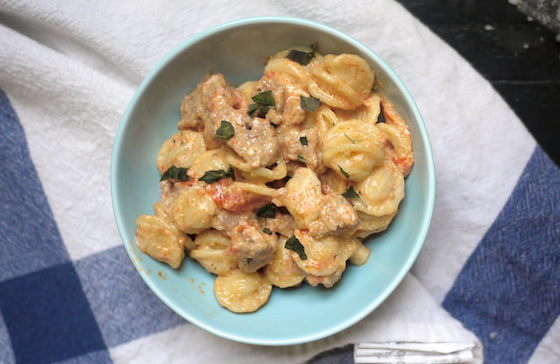 When Wednesday rolls around and I need dinner in a snap, I just sauté sausage (when using; this is great without, too), cook pasta and toss both with ricotta and the tomatoes in waiting. If you’re a super duper plan-ahead type, you can even cook the pasta in advance: check out my how-to precook perfect pasta. And, for what it’s worth, making homemade ricotta is ridonkulously easy and turns this great recipe into an out-of-this-universe recipe. If you’ve got milk, cream, a lemon and 15 minutes, give it a shot. It’s sooooo worth it! If you enjoy this pasta as much as the Hungry Family does, get ready to make it once a week. It’s that kind of good and the right price, too! 2. If you have not roasted the tomatoes ahead of time, about 15 minutes into your roasting time, bring a large pot of salted water (6 quarts of water to 2 tablespoons salt) to a boil over medium-high heat. Add pasta and cook per package directions (to get an authentic al dente texture, cook for 2-3 minutes fewer than indicated on the package). Drain, saving a mugful of cooking water. Set pasta aside. 3. In the meantime, cook sausage breaking the meat up with a fork. (If using sausage in casing, cut into ¼” chunks before cooking.) Once cooked through, use a slotted spoon to remove sausage from pan. Drain fat. 4. If you haven’t already, return drained pasta to its pot. Add sausage and roasted tomatoes, complete with cooking oil and accumulated juices. Stir in ricotta and season with salt and pepper. The oil and tomato juices will thin the ricotta to create a well-textured sauce. If the sauce is still too thick, though, use some of the reserved pasta cooking water to thin it to your desired consistency. Adjust salt and pepper, and finish with a drizzle of quality olive oil. Top with fresh basil, if desired.